This 3.5-liter engine is the result of the VQ-series modernization in 2006. 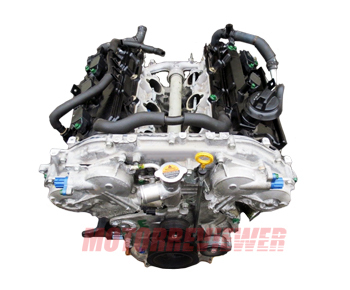 The VQ35HR engine was installed in rear drive Nissan and Infinity models basically. More than 80% of DE parts were redeveloped and modernized to allow the engine operates at high rpm for a long time. Aluminum cylinder block was reinforced and made a little bit taller (by 8.4 mm). In this case, the length of connecting rods was increased to 152.2 mm. New lightweight aluminum pistons increased the compression ratio to 10.6:1. Both camshafts are equipped with variable valve timing system CVTC. Valves have a bigger diameter and harder springs. Camshafts specs: duration 248/248, valves lift 10.54/10.54 mm. The engine got redeveloped plastic intake manifold and new sports headers. New intake system cuts air flow by 18%, while exhaust system flow increased by 25% for better ventilation of the cylinder volume. From 2010 Nissan produced hybrid models based on the VQ35HR engine using a lithium-ion battery. Total power of this unit is 360hp. Rough idle of the VQ35HR. The most common reason is the exhaust camshaft caps, check and replace them. Also, check out MAF-sensor condition. The VQ35HR as the VQ35DE is a very reliable and strong engine. Its maximum service life is more than 250,000 miles of smooth operation.